“Wake up kids//We’ve got the dreamers disease” – You Get What You Give by New Radicals. Is there anything more late ’90’s than the musical styling of New Radicals? One hit wonder, we salute you. One of the larger media news stories this week has been about the resurgence of a Veronica Mars movie. This was a show on the WB and UPN that had a rabid fan base. After its cancellation, the fans wanted a movie. Like anything in business: it’s all about money. Warner Brothers (who own the rights to Veronica Mars) knew there was a loyal fanbase, but didn’t think it was large enough to support more seasons or even a movie. But with Firefly and Arrested Development both getting second lives through the push of its fans, it might be worth a shot for Veronica Mars. For a project that big and that risky (if they’ll make the money back), you have to count on if there’s enough interest that will pay for something like that. The internet is fickle with its obsessions. The love of Snakes on a Plane didn’t transfer to so well on the big screen. Hollywood has this love/hate relationship with the internet and doesn’t know how to react to it just yet. Luckily, there’s a website where people can propose a project and if there’s enough interested parties willing to pay for it, the project will get funded and made: Kickstarter.com. If, by the end of 30 days the project doesn’t reach its goal, it doesn’t get made. Warner Brothers told Rob Thomas (the creator of Veronica Mars and not the Matchbox 20 lead singer), that if they could raise $2 million, they would green-light a Veronica Mars picture. It would meet the demand that the studio wants and pay for part of the movie (a win/win for Warner Brothers). 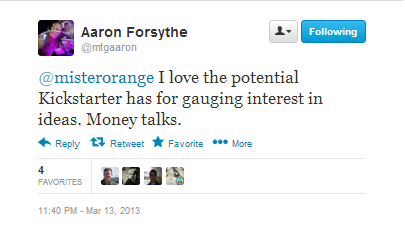 Now, $2 million is a lot of money; never had a Kickstarter project had a goal that large. If it failed, there would be no more talk of a Veronica Mars movie and it would only be part of a feverish fan’s dream. They met their goal in 24 hours. It was the fastest Kickstarter to $1 million and obviously the fastest to $2 million. As of this writing, with 29 days left in the Kickstarter, it has made almost $2.8 million. What does this mean to Magic? We can start getting new projects. Before we make the complete connection to Magic, let me explain Kickstarter a little better. Say I have a project that I want to get funded. I can submit it to Kickerstarter and explain why I need the money (most of the time it’s production costs of making said product). To entice people to fund the project before it happens, I give out different tiers of rewards for pledging money to me. It’s just like those PBS telethons where you get a copy of Season 1 of Downton Abby if you donate $100 and Season 1 and 2 if you donate $150. The more you’re willing to pay the more you receive. But here’s where Kickstarter gets interesting: the backer don’t pay any money if the project fails to get fully funded. It has 30 days to make its goal or the project doesn’t happen and the backers don’t pay anything. If your product doesn’t meet demand, then it’s not viable in the market (ignoring other factors like if it was priced right). However, if the project meets its goals you can make stretch goals to keep encouraging more donations. The image you see up at is the current Magic-related Kickstarter called” The Gathering: Reuniting Pioneering Artists of Magic: The Gathering“. It’s a book that has brought together artists from the early era of Magic to re-imagine famous pieces and tales from behind the scenes. What’s cool is that WotC supports this project even though they don’t control it. They were hoping to get $32,000 for a small print run. As of this printing, there’s two weeks left to be a backer if you want to. They’ve been doing stretch goal after stretch goal including adding more pages, making the book look better, and by offering more sketch cards from the artists themselves. I’m already a backer (no, Mom-in-law, you don’t need to find me a copy of this), and I’m really excited for this project. In fact, there have been several Magic related Kickstarters including a musical with puppets, and a little documentary “Magic: The Gathering World Championship Video” which in turn brought us “Walking the Planes” to cover of the Pro Tour. Again, what does it have to do with Magic? This, this is a very interesting thought. You can’t sell the product directly to the customers. At X level you get a vote on what art goes on the booster packs. At X level you get an Un3 t-shirt. At X level you get an Un3 playmat. At X level you get an Un3 playmat signed by Mark Rosewater. At X level you get an Un3 playtest card. At X level you get your name in a flavor text of a card. Again, I don’t know if you can do the playmats or other swag, but those are just ideas to get started. Magic players have started to show that they’ll support buying Magic related products besides just the cards. You can gauge interest in a product by tying the tiers directly to the product you are making without selling the product. If no one wants the items tied to it, most likely no one will want the actual cards.You can put the idea to rest or you can safely take the time and effort to create the set. It generates interest in the set because of the promotion of you pushing it. There might be some lag time between when the set is funded and when the set is released but that just factors into the whole situation. This doesn’t end with a third Un-set. Since I said I already love Magic swag, you can start there. It looks like they’ve been pretty successful with the Guild Shirts (interestingly that demand was there after PAX because people told WotC they wanted them), and I’ve got a Planeswalker messenger bag. I’m sure many of their other branded things have started to sell. How about that Magic: The Gathering show/animated series? It doesn’t even have to be a hit and make millions of dollars for WotC to consider it. You can focus on niche markets and, if it’s profitable, deliver to those fans. Like the makers of “The Gathering” have shown, you can target individuals that appreciate that aspect of Magic. It can be Magic related without coming from WotC itself if it gets the go ahead from the company. Now, I’m sure that this is much harder and since “The Gathering” has all new art, but this opens up the Magic community for different opportunities. While it can’t get a another Pro Tour stop (not the right market for a Kickstarter), it can get the juices flowing at WotC to find other small ways of getting their product to their fans. 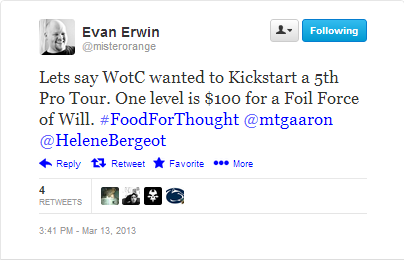 Everyone wins: WotC gets their brand and products out there more while the fans who want said product can receive it. If you haven’t already, go check out the Kickstarter for “The Gathering”. You have a chance to own a really cool piece of Magic related history. It shows WotC that there is a market out there for this type of product. While I’m not a Vorthos, I can appreciate the flavor of the game. The novels are coming back in terms of ebooks, and we still have the Magic comics. The market might be as large as previously thought, but if it’s making money WotC will still produce. By Kickstarting projects, we might just get what we want. This is just a new avenue for them to test their ideas, something I fully support. After all, Veronica Mars passed $3 million while I was writing this up. Money talks. WotC will listen.